A Senate aide tells Axios that President Trump said he wants to run on the Green New Deal in 2020. 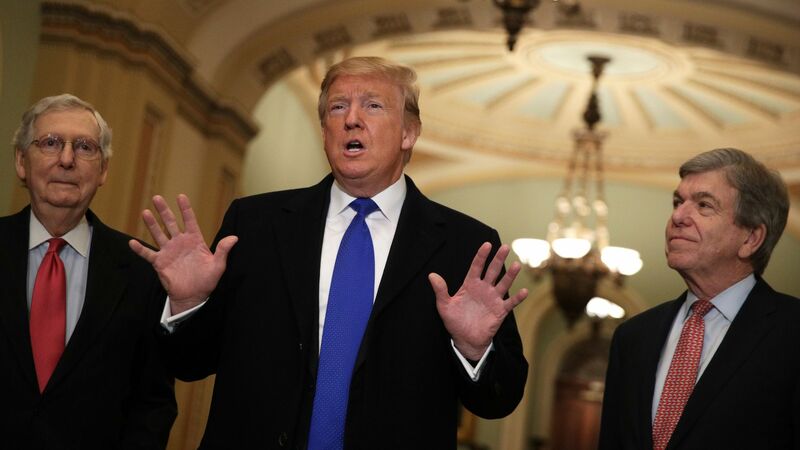 What he's saying: While speaking at Tuesday's Senate Republican lunch, Trump said, "You guys have done a great job on the Green New Deal. But don't kill it too badly, because I want to run on this" in 2020. Driving the news: No Senate Democrat voted for a Green New Deal resolution when Senate Majority Leader Mitch McConnell brought it up for a vote — even though all the 2020 candidates are co-sponsors. Most Dems voted "present" (neither for nor against), because they thought McConnell was trying to trap them — to put them on the record so they can be held accountable in campaigns. Four senators in the Democratic caucus voted no. So that's the Republicans' message: The Senate unanimously rejected the Green New Deal, one of Democrats' defining policies of 2020. Editor's note: This piece was corrected to show all 2020 Dem candidates are co-sponsors (not all Democrats) and to add there were 4 in the Dem caucus who voted no.